Ancient Egyptian intellect and brilliance know no bounds, they had a magical imagination and foresight which enabled them to explore and experiment with many ideas in order to gain a more reasonable understanding of the universe. 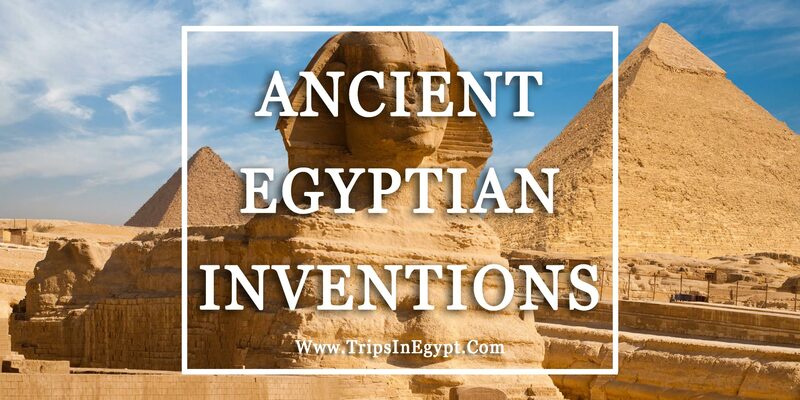 With the use of ancient Egyptian inventions, they were able to document their lives to the smallest details and safeguard all the amazing gadgets and discoveries they made. Through their amazing gifts, unlimited sources and infinite time, the ancient Egyptian inventions were able to make important contributions toward architecture, mathematics, science, art, and linguistics. They were able to attract the attention of the ancient Greek empire which viewed Egypt as the land of mystery, wisdom, and wonder. Egypt will always be recognized as the first civilization in history to spin the wheel of innovation. They were highly gifted when it came to the field of mathematics as they invented the basic and complex fractions as shown in the papyrus written in 1650 B.C.E and the earliest mentioned use of a decimal system was in 3100 B.C.E. they were highly efficient in division, multiplication, subtraction, and addition, plus they created various techniques to perform these calculations which are still used in modern-day computing. When it came to architecture they had the greatest achievements as some of the most marvelous structures can be found all over Egypt. By using their advanced architecture and knowledge in the shapes of triangle, square, quadrangle and other shapes and using them in making a precise measurement. They were able to build amazing monuments which stood the test of time like the Giza pyramids complex, the entire city of Karnak, plus a huge number of well-designed and crafted monuments across Egypt which acted as an inspiration for the Greek civilization to create their own stunning buildings. The ancient Egyptians were the first to invent a custom-made brick, cement, the usage copper plumbing in irrigation, the use of precise surveying in 2700 B.C.E to build their breathtaking structure and create an astronomical calendar in 2400 B.C.E which is still in common use today due to its accurate regularity. They truly innovated in the art of human anatomy that started in 3000 B.C.E. the Egyptian doctors were very famous all across the Mediterranean and had a positive reputation as they were able to stitch up wounds, repair broken wounds, and create prosthetic which is something unheard off at that time, also they used opium as a painkiller and consumed garlic and onions on a daily basis because of their health benefits. They cared very deeply about their dental hygiene as they used history’s first toothbrush and toothpaste. They treated the wounds and performed complex surgeries using the bronze surgical tool in 2700 B.C.E. They were true masters of empiricism and the first to explore the philosophy of life, art, morality, and existence. They made profound discoveries on the concepts of creation, afterlife, and how to regulate one’s life such as Ptahotep “the provincial ruler of Memphis” who wrote the first recorded philosophy book in history entitles”Instruction to Ptahotep” centuries before Confucius, Budda, and Socrates. They built the first postal service in history and were considered to be the world’s first historians as they documented their life on the wall of their temples, papyrus and stone tablets like the “Rosetta Stone” which held the key to deciphering the ancient Egyptian language and unlock many mysterious about their history and culture. The ancient Egyptians were excellent traders and know their way around a boat, plus they create many good diplomatic relations with their neighbors like Sudan, Phonesia, Crate, Greece, Persia, and many others. Egypt was considered a hot spot for trade in the Mediterranean and many valuable goods like cattle, gold, wine from Asia or precious stones from Persia or copper from Senia. They used their high intellect in the field of aerodynamics and shipbuilding tactics to develop a network of boats to transport goods and people and create a powerful naval force. In 1160 B.C.E, the ancient Egyptians were able to create the earliest form of the geological and topographic map of their region. Also, through their observation of the cycle of the Nile, they were able to create the oldest irrigation system and were able to build sickle blades and plows driven by oxen to loosen the dry soil. When it came to the concept of artistic design, the ancient Egyptians were able to infuse beauty and wonder into solid objects and create something truly enchanting. The ancient Egyptians created immortal works of art such as paintings, drawings, and various temples. they were pioneers in the field of metallurgy as they made bronze in 3300 B.C.E by merging copper and tin together, they used bronze to create various tools such as hunting tools like knives, arrow, heads, fishing hooks, weapons such as swords, helmets and shields and many carpentry tools like saws, axes, and chisels from bronze. They are known for inventing the pottery wheel which allowed the mass production of various vases and crockery in 3500 BC. They invented glass in 1500 BC by using silica sand and soda. They invented and used various forms of cosmetics, wigs and stylish jewelry. They had many board game like Senet in 3100 BC. Egypt gave birth to many original ideas and inventions which we still use until which enabled the country to build an unforgettable legacy, so it will be amazing to explore these ancient Egyptian inventions with an expert tour guide which “Trips in Egypt” provide through our majestic Egypt tour packages or luxury Nile cruise holidays.